Feature Documentary: 75 minutes. 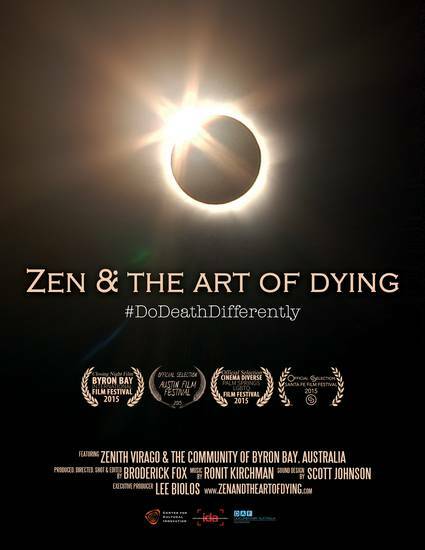 Zenith Virago is an activist and educator who for over 20 years has been returning the coastal region of Byron Bay, Australia to a more communal, celebratory, and creative engagement with death and dying. Distribution: Available on academic streaming service Kanopy and a range of other platforms. SCREENINGS: Pohoda Festival—Trencin, Slovakia, July 2016; KINO 43 Screening Series—Prague, Czech Republic, February 2016; Morbid Anatomy Museum—Brooklyn, New York, USA, January 2016; Santa Fe Film Festival—Santa Fe, New Mexico, USA, December 2015; Austin Film Festival—Austin, TX, October, 2015 (Heart of Film Program); Cinema Diverse: Palm Springs LGBTQ Film Festival—Palm Springs, CA, October 2015; Byron Bay International Film Festival— Byron Bay, Australia, March 2015 (Closing Night Gala Film).